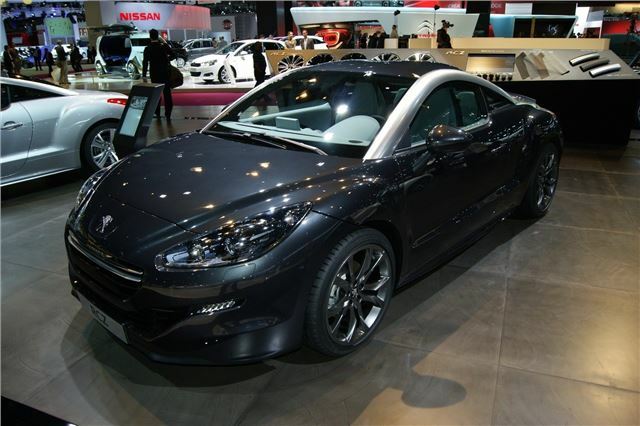 Peugeot has previewed the facelifted RCZ at the Paris Motor Show. It takes on the brand’s new ‘face,’ with a front end similar to recently updated 308 hatchback and cabriolet models. Gone is the oversized grille, replaced with a smaller, split design and the lights are slimmer. There’s also a less pronounced, more elegant bonnet bulge. The rear end remains unchanged, with the signature ‘double bubble’ roof still in place. The cabin gets a few light tweaks with improved materials, particularly in GT models, which get aluminium dash inserts and leather door inserts. New options, including more colours for the roof arches, lacquered grille bars, and a ‘black pack,’ which adds matte black details around the car are available. On top of that there are new wheel designs plus carbon roof options. But the biggest change is the introduction of a 260PS variant called the RCZ R (below), which features a limited-slip differential to improve handling and help cope with the extra power. It’s powered by the same 1.6-litre THP engine as the 156 and 200PS models, but has been heavily tweaked to produce 260PS, a figure you’d expect from a 2.0-litre model. The updated RCZ goes on sale in early 2013 and it's being displayed alongside the 2008 Concept and the 208 GTI at the 2012 Paris Motor Show.